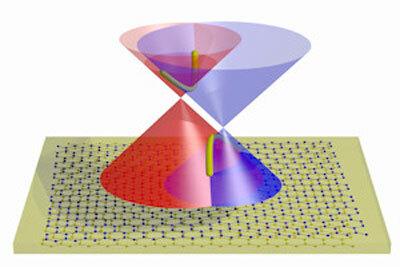 (Nanowerk News) Sandwiching layers of graphene with white graphene could produce designer materials capable of creating high-frequency electronic devices, University of Manchester scientists have found. Writing in Nature Nanotechnology ("Twist-controlled resonant tunnelling in graphene/boron nitride/graphene heterostructures"), the researchers have demonstrated how combining the two-dimensional materials in a stack could create perfect crystals capable of being used in next generation transistors. Tunneling transistors could open up new ranges of electronic devices Tunneling transistors could open up new ranges of electronic devices. Professor Laurence Eaves, a joint academic from the Universities of Manchester and Nottingham, said: “"This research arises from a beautiful combination of classical laws of motion and the quantum wave nature of electrons, which enables them to flow through barriers.